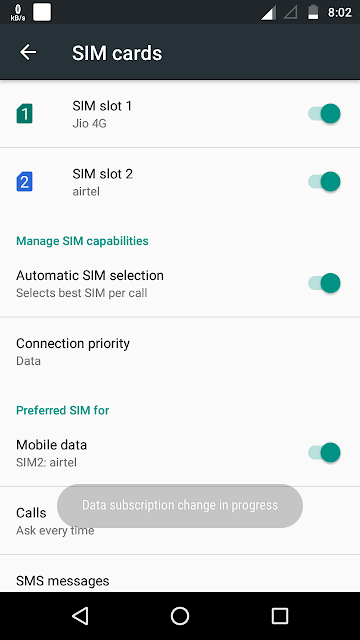 Recently I have come across a problem in my smartphone while switching from SIM 2 TO SIM 1 (Jio Sim). While switching the sim, the error which was coming " Data Subscription Change in progress" and i was unable to use Jio in Sim1. First Go to Settings of your smartphone. Now click on Settings and clear all data and cache file. Now You can easily switch your sim and enjoy Jio Sim etc. A video Tutorial is also created to help you out too.